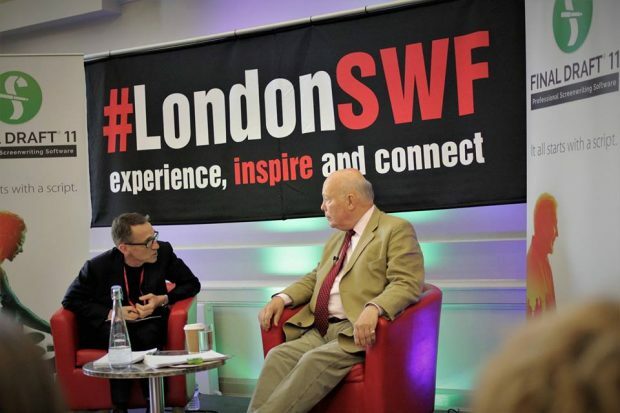 In an enlightening script to screen Julian Fellowes brought the very first episode of his world renowned period drama, Downton Abbey, along to the London Screenwriters’ Festival to talk us through it’s creation and the decisions that made it one of the most popular period dramas in the world with a global audience of over 120 million viewers. Joined by John York the discussion was truly an insightful look at how storycraft can give period drama an edge, so button down your best butler’s livery, be prepared to arch your Lady Mary eyebrows and join us to learn the top techniques you can use to create a compelling period drama for the modern age. At the time Downton Abbey was being developed Period Drama in the UK didn’t have a great audience draw. Many adaptations of classical works had been brought to screen, some adapted by Julian, but this time he felt he wanted to create something where the audience wouldn’t know what the outcomes of stories and the fate of the characters would be. Going all out with something completely new was a brave choice at a time when period drama was less profitable but the unpredictability paid off. The show became a ‘water cooler’ show that people talked about. Julian says that with a hit show, you generally see a climb in ratings around the third episode when news has spread and more people have caught up with and are tuning into the show. Downton had a spike of 2 million viewers in it’s second week. We talk about ‘the hook’ and really, Julian says, all it is, is making people care and keeping them caring about what happens next. Downton Abbey came about as an extension of the world of Julian’s Oscar winning movie Gosford Park. The idea of expanding on that era of country houses came up in casual conversation when another project Julian had been developing failed to come to fruition. Not only was it good timing to begin a new project but, the time the project was set in would be important. Where the film was contained in a short period of time, it was decided that going back to 1912 would allow for great topics should the TV series prove popular enough to expand to further seasons. Adding the tragedy of the Titanic firmly rooted the show’s timeline by aligning it with an historical period audiences would be familiar with already. Time played a part in creating the characters also, Julian had an interest in the stories of American heiresses who came to Britain with their substantial fortunes around that time and married into the British aristocracy. Some period drama had touched on this trend but very few got past the initial marriages to explore what had happened to the heiresses afterwards, living in the upper echelons of British society. The show was therefore conceived around the premise of Cora and her daughters. The first episode of Downton Abbey, right from the opening credits showcases a steam train and telegraph wires bringing a serious and important arrivals to a large country estate through it’s local village. We enter that grand home as the servants are waking up, then through a very long tracking shot the household unfolds to us leading us from the kitchens to the upstairs dining room past a bustling staff. The shot details the efficient morning workings of an Edwardian country house and it’s hierarchy. This is not only a beautiful technical shot, introducing us to the characters and their positions in the lavish and well run modern household, but fixes the show as a workplace drama and establishes the way of life for this country estate including charming periodical detail. We know where we are, what’s happening, who it’s happening to and that a catalyst for change is on the way within mere moments of screen time. Not everything needs over explaining and many of the storyline aspects are teased rather than detailed extensively or bogged down with exposition. Even before the first ad break, Downton has not only established it’s time period and place, the way of life, and endeared the characters to us by including very human grumbles, gossips and rivalries, it’s established audience curiosity. New things like electricity are changing the way people live and the sinking of the Titanic followed by a morning telegram confirming the probable death of Lord Crawley’s heir will further affect all these people’s lives. How things will change, who will now inherit, what it all means, and what part the arrival of a new and strangely unsuitable valet will play are the questions that will keep viewers tuned in past the ad break and form the beginning of their investment in the show. In past decades of period drama greater weight might have been given to the romantic lives of the upper classes, but for Downton Abbey, giving equal dramatic weight to the upstairs and downstairs characters was not only suited to the interest of the present day audience but also suited a multi-arc drama. Every move from one scene to another takes an audience from characters they’ve become interested in, and switches them into the middle of another group. Each change must establish what those characters are feeling in order to maintain interest and it’s important that audience are pleased to spend time with all characters and like them, even if that is just liking to dislike them. The show received some initial criticism about not being culturally inclusive and on a superficial level those might seem a valid criticism for a period piece about a posh house, but even in it’s very first episode Downton Abbey deals with issues of feminism, women’s fortunes, rights and status, the deep isolation of being gay at a time when it was illegal to find love and the social fear of becoming injured and unable to work and support oneself at a time before social welfare. The starkly obvious class differences are all laid bare, and the show doesn’t shy from these topics relevant both to the time period and issues our own era. As the show progresses topics reflect both the micro and macro, both in how they affect the characters we see and revealing the larger state of an empire adjusting itself to changing times. Choosing to make a loyal portrayal of an historical period means that you can’t completely change what the way of life was. In Downton therefore, cross-class relationships tended to be most friendly with those closest to the family members, their body servants. Bates and Lord Robert’s time together in the Boer War gives those two characters relationship an extra degree of trust. It’s this extra layer that allows Lord Robert to move past the usual protocol of deferring to one’s butler about whether staff are suitable and keeping Bates on despite his injured leg and despite considerable opposition from Cora, O’Brien, Thomas and Carson who manipulate each other into a faction against Bates. Julian also feels that family, in his experience, do not always get along terribly well so he created different dynamics of relationship between characters. Maggie Smith’s Dowager Countess turns up dressed in head to toe black, mourning dress for the Titanic loss of their family member, but the black also mirrors her implacable personality and her curt acknowledgement that she and Cora may be allies but not friends is the first of many such enjoyable sleights. Delicious schadenfreude to today’s audience perhaps, but also historically, fairly typical of upper class snottiness. Everything works on more than one level making things lively and entertaining. It’s these complex layers of personality and storytelling that helped Downton Abbey grasp and hold it’s audience. The show, after it’s close, has remained relevant and beloved enough to sprout a movie sequel which is currently shooting and is eagerly awaited by fans. No doubt it will contain all the richness of the TV show through the tremendously effective writing considerations that Julian Fellowes took time to share with us. Thanks so so much for an amazing, astonishing, brilliant, inspirational Talent Campus experience!!!! I am over the moon about it!